Whelped 2-13-09 - Past Litter, All Pups Sold Spring, 2009. Livingston, MT & Whitehall, MT. E-mail Todd Pups will be ready to go home on Good Friday, April 10, 2009. Actual pup pick up day will be Sat. April 11th or thereafter. 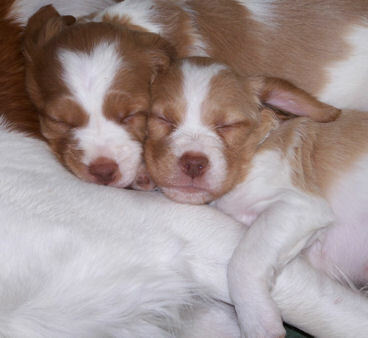 Most of the pups doubled their birth weight in the first 8 days! This is a very active and alert litter of pups! Smokey and Ruby sleeping on momma Maggie - 30 days old. 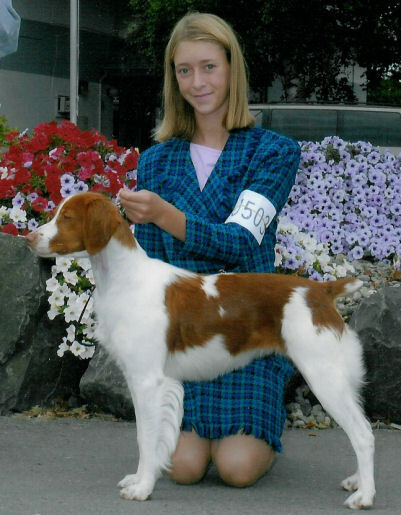 Sari with Maggie, showing as a Junior Handler, 2007. Dubb - from the cover of the American Brittany Club magazine. CH Warbonnet Golden Magpie, JH "Maggie" Whelped: 12/18/04. OFA Good, Elbows: normal. OFA #: BS-13667G27F-PI. By DC Wyngold's Tough To Touch x CH Wyngold Wyndy Warbonnet, bred by us (Todd & Jan Breitenfeldt) out of Wyndy and Redd. Maggie is a happy, classy looking girl who's tail is always a waggin (waggy Maggie! :^). She is (as with all our dogs) a mixture of Dual Champion field and show lines that HUNT! Mag is as part of the family and is a real bird finding machine! 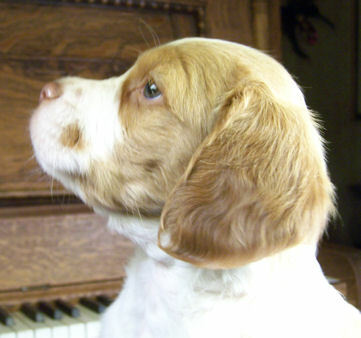 She has AKC puppy and derby field trial placements, her AKC Junior hunt test title and is a show Champion as of 9-19-07. She was handled to her Championship completely by our daughter Sari. Maggie finished with 17 points and 4 Majors: 1) Spokane, WA, 2) Filer, ID, 3) Enumclaw, WA, and 4) Bozeman, MT. Maggie really enjoys practicing agility! She is locally known as "the butterfly Britt" because she is obsessed with catching butterflies on the wing and does aerial acrobatics in front of the hunt test/field trial gallery, after the brace. 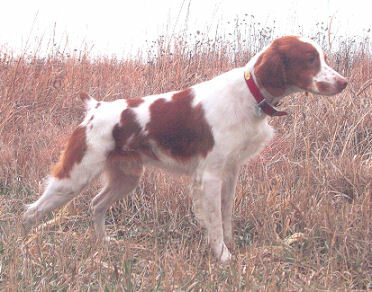 Besides much hunting, she will be working on her Senior/Master Hunter title and will do field trials. WE ARE EXCITED ABOUT THESE PUPS! "Dubb" is a 39 lbs, exciting, wide ranging, gun dog with plenty of stamina for hour stakes or all day hunts. He has great bird finding abilities with his points being staunch, stylish limb finds. "Dubb" has been DNA Certified and is O.F.A. excellent. 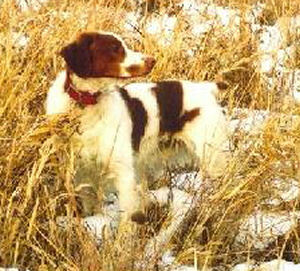 Dubb is proudly owned by Kevin and Sandra Remmers, Clyde's Creek Brittanys. Deposit: Non refundable $100 deposit if we have available the gender of your choice. Competition homes will have preference choice of competition/show quality pups. We welcome co-ownership with competition homes and Junior Handlers! As breeder, we reserve the right of first choice.